Belfast Giants held onto the top spot in the Elite League standings with a 3-1 win over hosts Fife Flyers. Darcy Murphy scored two late goals as the Giants survived a scare to maintain their narrow lead in the title race. Brett Bulmer's brilliant third-period goal for Fife cancelled out Dustin Johner's opener but Murphy's dramatic double secured a thrilling victory. Adam Keefe's side are tied on points with holders the Cardiff Devils but have more wins in regulation. 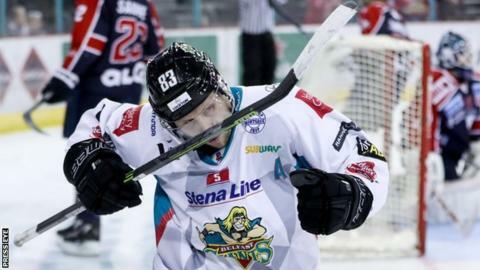 Cardiff, who have played one game less than the Giants, beat Glasgow Clan 5-2 on Wednesday to keep pace with the leaders in their head-to-head title battle. The Giants took the lead on 14:19 at the Fife Ice Arena when Johner regained possession deep in the home side's defensive zone before finding Colin Shields on the right and he quickly dragged a pass back into the path of his fellow forward, who sent a powerful shot past Shane Owen in the Flyers' goal. Johner's strike gave the visitors a deserved lead as they dominated possession in the opening period but they had goalkeeper Tyler Beskorowany to thank as they survived two power plays in quick succession during the middle section. Fife grew in confidence as they held the league leaders to a single goal and they levelled the game with less than 12 minutes remaining when Bulmer brilliantly evaded three attempted challenges before firing past Beskorowany. The home side thought they had taken the lead just moments later with a wraparound move by Chase Schaber but the Giants survived thanks to an umpiring call. The visitors regained the lead on 17:08 with a superb power-play goal by Murphy after Fife's Ricards Birzins was penalised for slashing. Flyers pulled their goalkeeper in the dying seconds as they pressed for a second goal but the Giants punished their hosts on the counter-attack as Murphy finished into the unguarded net with 52 seconds remaining. The Giants now have just 10 league games remaining and will return to action when they travel to face Sheffield Steelers on Saturday.